Are We Pausing or Stalling at Resistance? The S&P 500 broke through the 2,800 milestone Monday after Trump officially postponed the March 1st Chinese tariff escalation. That put traders into a buying mood. Unfortunately, the enthusiasm was short-lived and we quickly slipped back under this widely followed level. We flirted with 2,800 resistance again Tuesday, but ultimately we were unable to close above it. 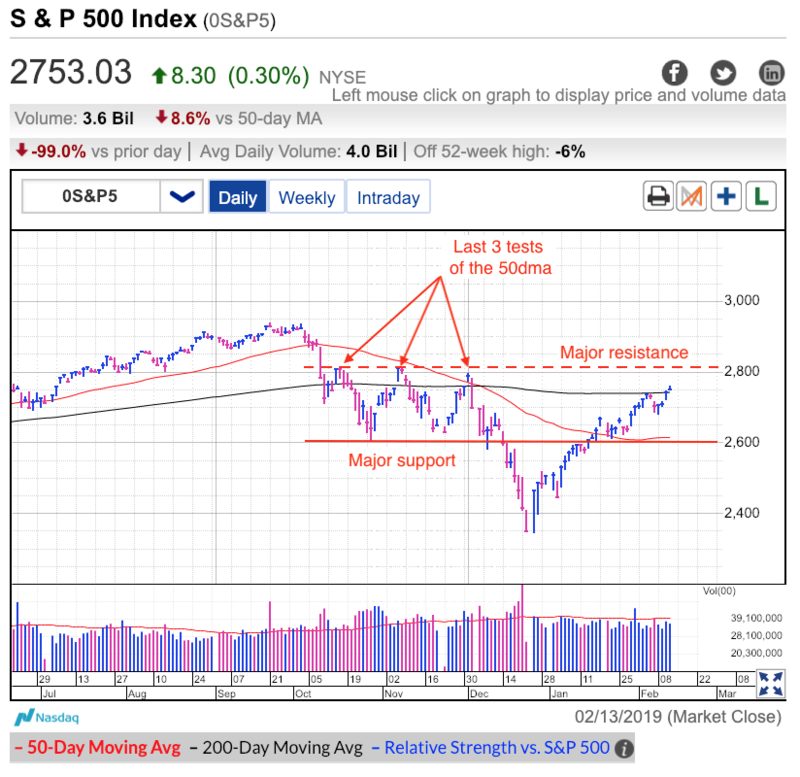 The market hit its head on 2,800 resistance last October, November, and December, each occurrence resulting in a significant tumble. Over the last two days, it has proven to be a stumbling block again. Will this time end differently than the last three? That is the question everyone is wondering. Widely watched resistance levels often turn into self-fulfilling prophecies. Prices rally up to resistance. Technical traders see this signal as a good place to take profits. Their profit-taking pressures prices, leading to a small pullback. Other traders see the weakness develop, so they start selling too, adding even more pressure. Prices keep slipping until either we run out of sellers, or they are attractive enough that dip buyers jump in and take advantage of the discounts. Given how far the market’s come since the Christmas lows, it wouldn’t be a surprise to see the market take a break and catch its breath. In fact, that would be the normal and healthy thing to do. I would be far more concerned about the sustainability of this rebound if we keep racing ahead without resting. The daily back and forth is what keeps the market fresh. These gyrations squeeze out the weak and replace them with the confident. But we have had very little pausing and refreshing since this rebound began back in December. Unfortunately, that means a lot of weak hands are still holding on. Rather than flush them out in small, periodic pullbacks, the supply of weak hands is building up to the point where the next pullback could trigger a mass exodus and do a lot of damage. In many ways, the market is like a forest. Small fires clear out the debris and keep it healthy. Wait too long between fires and too much fuel accumulates, meaning the next fire has the potential to be devastating. At the moment, everything is great and everyone is enjoying themselves. But all it takes is one spark to send everything up in smoke. The challenge is knowing what that spark will be and when it will come. Until then, everything will be great. Prices will keep drifting higher until they don’t. Knowing what the market will do is the easy part because it keeps doing the same thing over and over again. The hard part is getting the timing right. That is where all the money is made. While we don’t know the timing of the next dip, that doesn’t mean we cannot prepare for it. For our long-term positions, there is nothing to see or do here. If we are not selling for years, what happens over the next few weeks is meaningless and we can (and should) completely ignore these near-term gyrations. But for a short-term swing trade, we need to be careful up here. Given how far prices have come, the rewards left ahead of us are a lot smaller than the risk underneath us. The time to buy the discounts was weeks ago, not now that prices are far higher. If a trader is doing anything, they should be taking profits, not adding new money. We only make money when we sell our winners and that almost always involves selling too early. People who get greedy and hold too long often end up giving back all of their profits and then some. To be clear, I’m definitely not bearish and am not predicting a collapse. I’ve just been doing this long enough to know that I should be cautious when everyone else is feeling good. I’m not calling a top, just warning people to be careful. A routine pullback to 2,600 is most definitely not a collapse, but it will feel like it if a person wasn’t prepared for it. The best way to avoid making poor trading decisions is to not be surprised by the normal and routine. On Thursday, the S&P 500 posted its biggest loss in two weeks. Of course, biggest is a relative term since we only gave up 0.35%. And the competition wasn’t all that fierce since there was only one other down day in that span. But that is an indication of just how comfortable this climb higher has been. Last fall’s plunge scared a lot of emotional investors out of the market, but now that fear is a distant memory. Long gone are predictions of global economic collapse. It been replaced by fear of being left behind. Last year’s fearful sellers turned into this year’s desperate buyers jumping on every dip in price, no matter how small. This desperate buying is why every bout of opening weakness has been gobbled up and we finished all these days higher. But the thing to remember about emotional sellers is there are only so many of them. We saw that in late December when we ran out of sellers the day before Christmas. The market bottomed and prices rebounded, not because everything got better, but because we ran out of people willing to sell the fear. And here we are nearly two months later. But instead of running out of sellers, we need to be worried about running out of buyers. Once all of last year’s fearful sellers finish buying back in, who is going to be the next buyer to keep chase prices higher? While almost everyone loves calm climbs higher, rather than be lulled into complacency, we should be getting nervous about what happens next. The market finishes higher 53% of trading days, meaning it falls the other 47%. If a person believes in reversion to the mean, and they should, expect this string of up-days to be offset at some point by a string of down-days. That said, claim the market is going to fall long enough and eventually you will be right. But in the market, we only make money when we get the timing right. Not only do we need to know what the market will do, we need to know when it will do it. And without a doubt, timing is the hardest part to get right. But we don’t need to know exactly when something will happen to make money in the market. Trading successfully is about playing the odds and managing risk, not predicting the future. Momentum is definitely higher and a trend is more likely to continue than reverse. But there always comes a point where it is no longer worth it. When the remaining reward shrinks and the risks grow. Prices are quickly approaching major resistance above 2,800 and we haven’t had a meaningful pullback during this nearly 20% rally. How many points of profit are still above us? 30? 50? How many points of risk are between us and support? 180? Risking hundreds of points to make dozens hardly seems like a prudent trade. The most nimble day traders can squeeze the last few dimes out of this rally, but the rest of us should definitely be growing defensive. Anyone still buying up here clearly doesn’t understand how markets work. Don’t get me wrong, I’m definitely not bearish. But I don’t see any reason to be chasing prices higher after such a big run. While I don’t know exactly when the next pullback will happen, I do know it will fall through current levels. If we are returning to these prices at some point over the next few weeks, should we really feel pressured to buy today or risk getting left behind? The biggest risk these late-buyers have is getting cold feet when prices inevitably dip under their buy point. Do they get scared again and bailout “before things get worse”? Sell last December’s plunge. Buy this February’s surge? Sell April’s dip? No wonder most people lose money in the market. If we want to make money, we should do the opposite. Buy when other people are fearful and sell when they are greedy. The S&P 500 popped Wednesday morning after word spread Trump was willing to sign Congress’s budget compromise. Avoiding another government shutdown eliminated a major risk in front of us and put traders into a buying mood. Unfortunately, that excitement didn’t carry into the close and prices finished near the intraday lows. A 0.3% gain is still a 0.3% gain and it allowed us to reclaim the 50dma for the first time in more than two months. But if we wanted to be critical and look at the half-empty side, closing near the intraday lows on a good news day is most definitely noteworthy. One day doesn’t make a trend, but it is something to keep an eye on going forward. Almost every day since the Christmas bottom finished near the intraday highs and this late-day buying frenzy propelled us to these highs. But if that buying is waning, it could be an early indication the rebound is shifting into the next phase of the cycle. 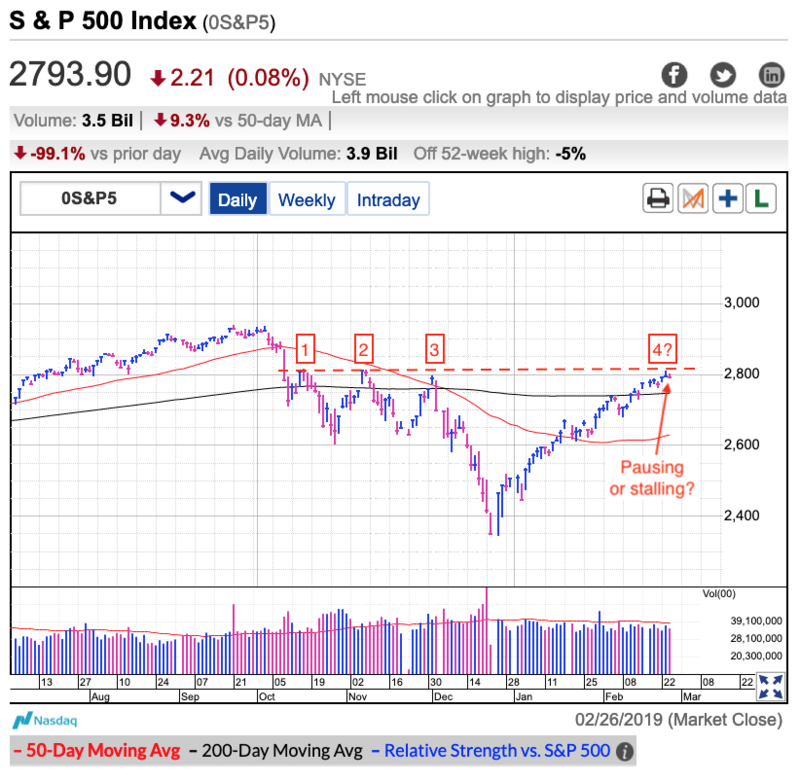 The other reason to be cautious is things didn’t end well the previous three times the market retook the 50dma. While there is no comparison between now and where sentiment was last fall, widely followed technical levels have a tendency to turn into self-fulfilling prophecies. Technical traders expect prices to stall at overhead resistance, so they start taking profits proactively, launching the wave of selling that eventually leads to the dip in prices. I’ve been warning traders to tread likely after the market rebounded nearly 20% from the December lows. And some people criticize me because prices have continued creeping higher. But I’m okay with that. People also criticized me for saying in December people should be buying those discounts, not selling them. By now hopefully everyone appreciates how that one turned out. After doing this for so many years, I’ve long since gotten used to going against the crowd and actually find reassurance in the criticism because it means I’m on the right track. Nothing makes me more nervous than when everyone agrees with me. And just because the market has been creeping higher the last few days and weeks doesn’t mean buying up here was the smart thing to do. Allow me to use a blackjack analogy. If a person hits on 18 and he gets a 3 card. That was a great call and he won the hand. But was that really the smart thing to do? While it worked great this time, how often will hitting on 18 backfire? Traders who last a long time in this business understand the monumental difference between being right on a an individual trade and trading smart. Unless you learn to trade to smart, you won’t last very long. The market continues to act well and momentum is definitely higher, but anyone buying up here is being just as foolish as the guy hitting on 18. Unfortunately, that is the way most people trade. Those that were selling last December’s dip are now chasing 2019’s rebound. Sell low and buy high rarely works out. Those with long-term investments should stick with their favorite positions. But those with trading profits should be shifting to a defensive mindset and thinking about taking profits if they haven’t already. This rebound priced in a lot of good news. That means there is far less upside left ahead of us and a lot of air underneath us if things don’t go according to plan. The S&P 500 stumbled Thursday in one of the few misses since the Christmas rebound kicked off. 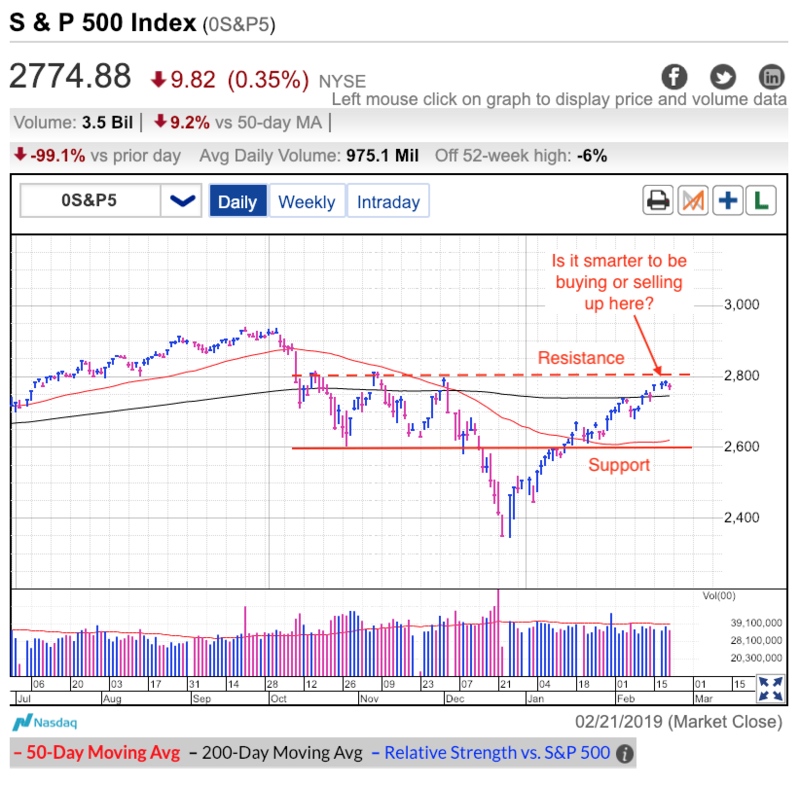 Over the last few days, the index struggled to break through 200dma resistance and has slipped back to the psychologically significant 2,700 level. We knew this was going to happen, we just didn’t know the when or the why. Thursday’s weakness started before the open when European economic data failed to meet expectations. That brought last year’s global growth fears back to the front. The only question is if this is just a single bout of indigestion, or if this will trigger another wave of second-guessing and defensive selling. The nice thing about today’s dip is we found a bottom before lunchtime and closed well off the early lows. That is the opposite of last year’s dreadful price-action when early weakness triggered runaway selloffs. At least for the time being, investors appear more inclined to buy the dips than pile on the selling. But it takes more than one day to consolidate nearly 400-points of gains, so we have a long way to go before we can waive the all-clear flag. Smart money buys discounts and sells premiums. It is definitely premature to call a one day dip a discount and we should be prepared for more. But as long as we know it’s coming, then it is a lot easier to maintain our composure and resist the urge to join the hysterical crowd. The market is acting well and there is nothing to do with our favorite long-term investments. But for our short-term swing-trades. This is a good time to get defensive and start taking profits if you haven’t already. On Tuesday, the S&P 500 slipped fractionally, but more importantly, it continues holding this month’s 2,600 breakout. Over the weekend, Trump and Congress agreed to a temporary budget that allowed government workers to return to work and collect back pay. That was a critical development for Federal workers who missed two paychecks, but the political situation is far from resolved and the market actually declined Monday. As I wrote last week, the 10% rally from the December lows priced in a lot of optimism the problems triggering last month’s swoon would be resolved. Unfortunately, that also meant any compromise was already largely priced in and stocks actually fell Monday because our politicians only offered a temporary solution. The other significant development is the U.S. government’s criminal probe into Huawei, one of China’s most important companies. No doubt this escalates trade war tensions between these two economic superpowers. Both of these events could be interpreted as bearish, and that’s the way the market took it, with declines on Monday and Tuesday, but the silver lining is the losses were relatively restrained. Taken together, the last two days of selling didn’t even trim 1% of value and we are still above the psychologically significant 2,600 level. Based on how volatile the previous three months has been, this week’s dip was barely a tremor. I like how well the market is holding 2,600 support. Prices tumble from overbought and unsustainable levels quickly. This is our third week above this level and shows real demand for stocks at these prices. If equities were fragile and vulnerable to a tumble, there have been more than enough triggers to send us crashing back to the lows. Instead, the market shrugs the negativity off and continues holding recent gains. This is a dramatic improvement from late last year where even the smallest hint of a problem hiccup would send traders scrambling for the exits. While the market’s mood has done a 180, its not that investors changed their mind, but that we changed investors. Fearful owners sold their stocks at a steep discount to confident dip buyers willing to hold these risks. After enough turnover takes place, we run out of fearful sellers and confident dip buyers disregard flare-ups of recycled headlines. That’s how we go from 250-point free falls to 300-point rebounds. The problem with 300-point rebounds is those rate of gains is clearly not sustainable for any length of time. And this two-week consolidation above 2,600 support is proof of that. The market needs a breather and there are two ways this plays out; the dramatic stepback, or a mind numbing sideways grind. One scares weak traders out, the other bores them out. To this point the market has resisted invitations to pullback. Big money seems more interested in buying these discounts than selling the fear and that is keeping a floor under prices. But at the same time, big money hates chasing prices higher and we can see their reluctance show up in the stalled rebound. In many ways, their reluctance to buy after a big move higher is a self fulfilling prophecy that creates the very dip they are worried about. But given how well the market is trading, most likely any near-term dip will be a buying opportunity. While there is no reason to abandon our favorite long-term investments, there is also no reason to chase prices higher. Either we dip under 2,600 over the next few days or weeks, or we trade sideways for a while. Neither setup creates a good short-term buy. Instead, we should be patient and wait for a better entry. 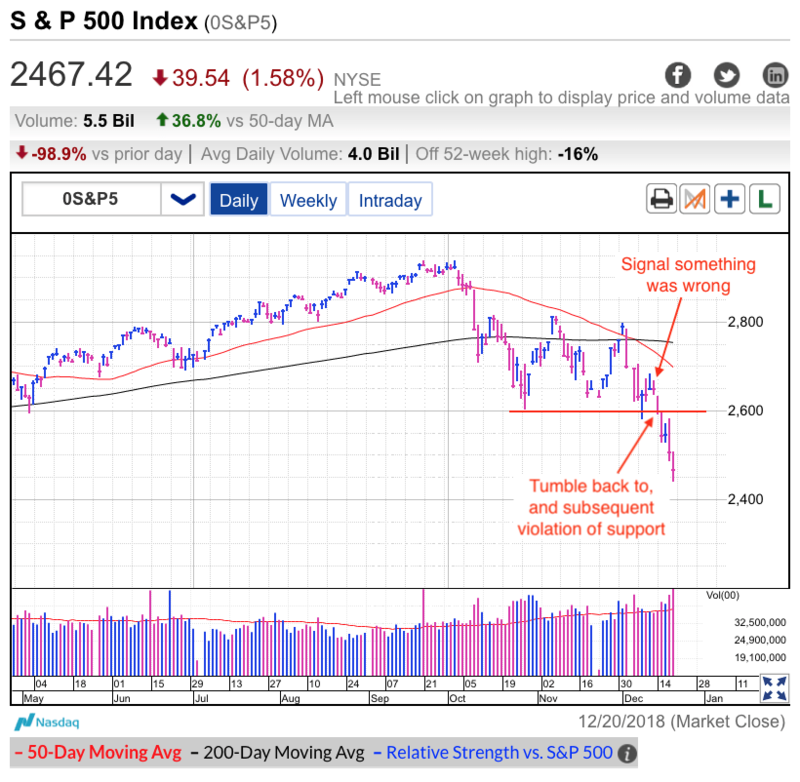 If the market fails to rally on good news and finishes at the lows for a few days in a row, that is a bearish signal and an inviting short entry. If prices fall under 2,600 support, but quickly find a bottom, then that is our signal to buy the dip. And if we keep grinding sideways, then we just sit and watch. We only want to hold the risk of owning stocks when we are getting paid for it. If stocks are drifting sideways, we’re not getting paid and should be watching safely from the sidelines. We only want to buy when the risk/reward is stacked in our favor and that is not the case at these levels. Apple reported its first declining revenue and earnings in more than a decade. But everyone knew this was coming and is why the stock was down nearly 40% from the highs. But the thing about the risks is they were already incorporated into the price. And like most things in the market, it probably even over did it. If after-hours trade is any indication, AAPL will pop nicely tomorrow as reality turns out less bad than feared. If these gains stick Wednesday, it would put AAPL at the highest levels in over a month and easily erase the early January tumble when Apple lowered its guidance. At this point, it looks that dreadful day when the crowd was rushing for the exits was actually one of the best entry points in over a year. Since then, AAPL is up 15% from those lows. 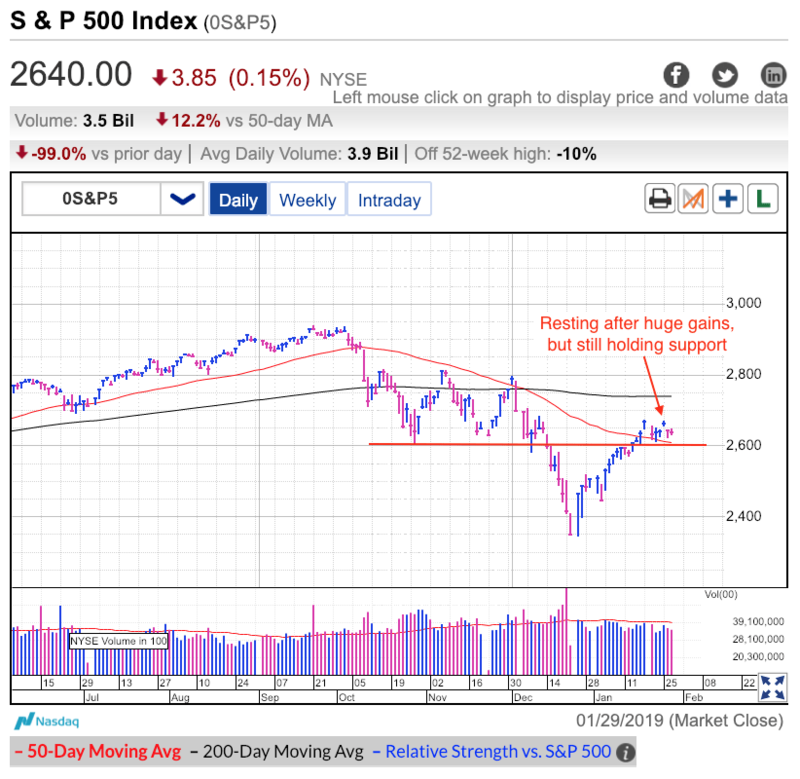 On Thursday, the S&P 500 bounced between modest gains and losses. 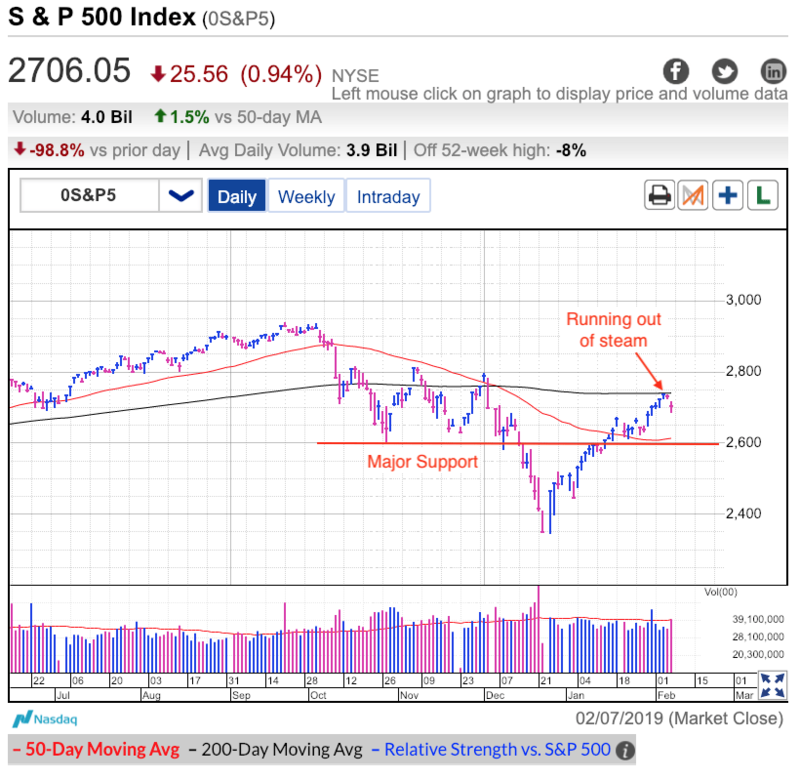 The gov’t shutdown is dominating headlines and there is no end in sight, but the market doesn’t care and continues holding last week’s 2,600 breakout. It’s been a wild ride from the Christmas lows, but so far the market is still acting well. Prices tumble from unsustainable levels quickly and holding 2,600 for more than a week is a good sign. Especially in the face of bearish headlines. If prices were grossly overbought, we would have tumbled by now. That said, the last few weeks priced in a lot of good news in anticipation of breakthroughs with China and the shutdown. The problem with hope is it leaves us vulnerable to disappointment if things don’t go according to plan. While the market is acting well and trading like it wants to keep going higher, as long as we continue hovering near 2,600 support, we always run the risk of violating it. I remain cautiously optimistic, but I reserve the right to change my mind if conditions change. But just because the market is acting well doesn’t mean this is a good time to add new money. Only a fool chases prices higher after a 10% move in a few short weeks. As I often write, markets move in waves. Understanding that principle in October, November, and December allowed us to profit nicely from sharp bounces on our way lower. And now that the market is recovering, we must acknowledge any rebound will include big drawdowns on our way higher. To expect anything different would going against the very nature of the market. I don’t see any imminent warning signs of an impending collapse, but that still doesn’t mean this is a good time to be holding a short-term trade. No matter what happens next, the market will do something. Maybe it goes higher, or maybe it goes lower. One side will be right and the other side will be wrong. But just because the market will move doesn’t mean there is a good trade for us. I buy when the odds are skewed in my favor. When the risks are small and the rewards large. Most of the time this happens when the market dips. Fearful sellers offer stocks at steep discounts. The more the indexes fall, the less risk there is because a big chunk of the downside has already been realized. And the lower we go, the greater the reward we collect when prices rebound. But right now we have the opposite. The 10% rebound from the Christmas lows consumed a huge chunk of the upside. And now that prices are far more expensive, there is a lot more risk underneath us. Stocks are acting like they want to keep going higher over the near-term, but the limited upside remaining and heightened downside underneath means the risk/reward is now skewed against us. Stocks are acting well and like they want to keep going higher over the near-term, but I’d rather be taking profits at these levels than adding new money. That said, this outlook only applies to my short-term trading account where my holding period is a few days or weeks. For our favorite buy-and-hold investments (think retirement accounts), there is no reason to sell and in fact, smart savers increased their contributions during this market volatility. The S&P 500 slipped Tuesday, ending a string of four consecutive gains and posting the biggest loss in nearly three weeks. It’s been a great run since the Christmas lows, with the index surging 10%. But as we know, markets don’t move in straight lines and a down day was inevitable. The question is if this is just one of those step backs before continuing higher, or if today’s weakness marks the end of the rebound. Stocks have been surging despite December’s negative headlines sticking around. Nothing has been resolved in Trump’s trade war with China. Global growth continues to slow. The Fed is still planning further rate hikes. And the federal government has been shut down for a month with no end in sight. Hardly seems like rally material, but that is exactly what happened. While the news has most definitely been bearish, it hasn’t been as bad as the crowd feared when they were scrambling for the exits at the end of last year. Markets are prone to excess and that means oversized moves in both directions. Last summer we went a little too high. Then we fell too far in the fall. And now there is a good chance January’s rebound went a too far and it is time for a well-deserved rest. Even a pullback would be a normal and healthy way to process these gains. Where we go from here largely depends on what happens next. 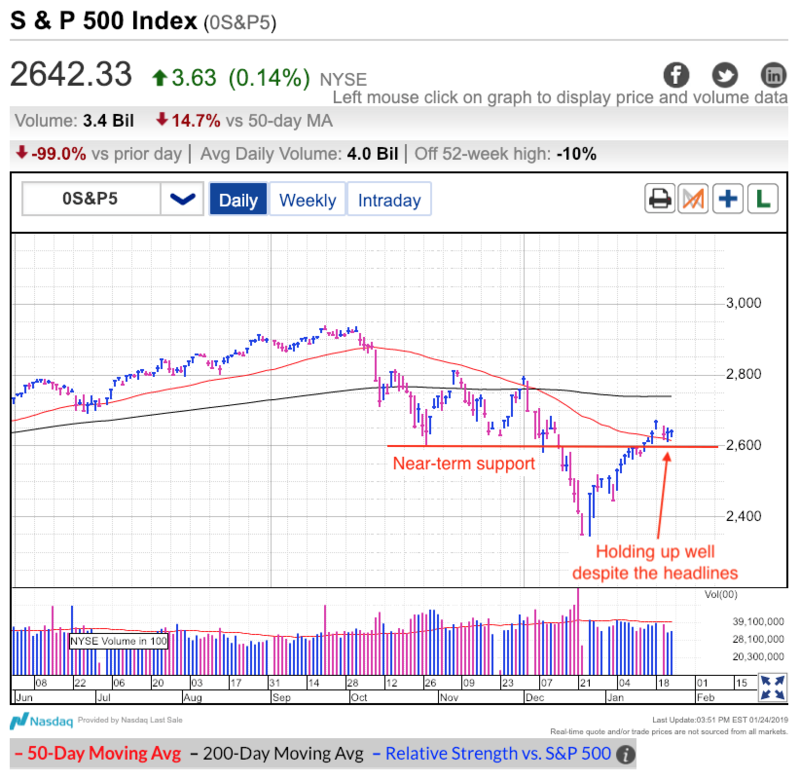 Last week we reclaimed the widely followed 2,600 support level that propped the market up through October and November. 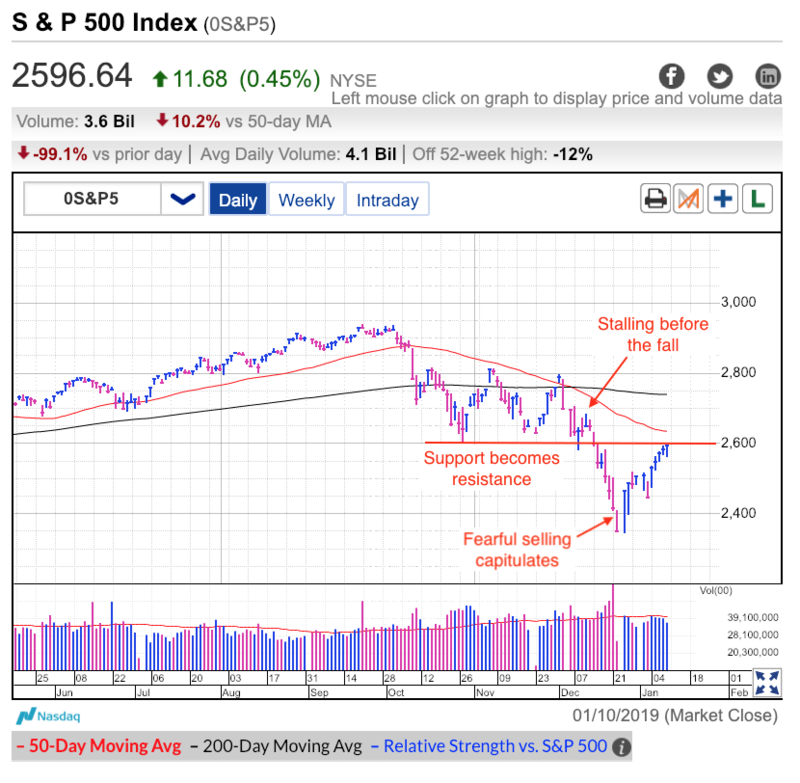 While any near-term weakness will most likely dip under 2,600, how the market responds to such a violation will tell us what mood traders are in. In December, fearful owners rushed to sell every hint of weakness. But the thing is, eventually we run out of fearful sellers. That’s because every person desperate to bailout ends up selling to a confident dip buyer who is willing to hold the risks. Out with the weak and in with the strong is how these things get turned around. While bearish headlines are largely the same, and in some respects have even gotten worse, the market stopped caring. And not only has it stopped caring, it is acting as if everything has been getting better. But that is the way the market works. Buy the rumor sell the news. While we don’t have a resolution to any of the problems facing us, the market is assuming a solution is coming and anyone waiting for the confirmation will be too late. But that assumes things turn out less bad than feared. There is an alternative outcome where the situation turns out worse than feared. And that is what it will take to send this market to fresh lows. But until that happens, expect every dip to bounce. Having surged 300-points since Christmas, it is clearly too late to be chasing the rebound. Instead, we should be shifting to a defensive mindset and preparing for a consolidation. Savvy short-term traders have been taking profits into this strength. The most aggressive and nimble can try their hand at shorting this weakness. For the less bold, a dip under 2,600 support will likely find a bottom near 2,500 and that would be a great dip buying opportunity. If this market is healthy market, we shouldn’t get anywhere near the lows and retesting 2,400 would be a very bearish sign. Trade accordingly. What a difference a few days makes. Three weeks ago the financial world was collapsing and desperate sellers were scrambling for the exits. This week everything is peachy as the market erased the pre-Christmas bloodbath. But this isn’t a surprise to those of us that have been paying attention. “While I like these discounts, the looming holidays complicate the situation. What would normally be an attractive buying opportunity might struggle to get off the ground since big money already left for Aspen. Their absence puts impulsive retail investors in charge and that is rarely a good thing. Luckily, these little guys have small accounts and their emotional buying and selling cannot take us very far. The market one-upped the Thanksgiving rebound and recovered 250-points since the Christmas holiday. Those of us that kept our cool enjoyed the ride. Unfortunately, those that panicked are kicking themselves right now. But that is the way the market works. It rewards thoughtful and deliberate decisions while it punishes the impulsive and reactive. The key to surviving periods like this is selling poor price-action, not fear. By the time fear is running through the herd, it is too late to sell because most of the damage has already been done. In fact, selling fear is often the exact wrong move to make because capitulation and a rebound is usually just around the corner. “the last three day’s has seen early gains fizzle and we closed well under the intraday highs. Multiple weak closes is never an encouraging sign. And as usual, the market is giving us conflicting signals. It is up to us to determine what it means. Everyone knows what happened next. But the thing to remember is the market was flashing these warning signs days before the crash through support. A savvy trader could have bailed out a full 300 points above the eventual bottom. I will be the first to admit I have been, and continue to be, bullish. But just because I believe in the economy doesn’t mean I need to ride stocks down. The biggest advantage individual traders have is our size allows us dart in and out of the market with ease. We don’t need to ride these waves lower as long as we know what to look for. But that was then and this is now. What most readers want to know is what comes next. And as I often remind people, the market doesn’t move in a straight line. The rebound from the Christmas lows has been a beautiful thing, but rebounds only go so far before they run out of gas. As expected, the rate of gains has slowed as we approached the prior lows near 2,600. What was once support has now turned into resistance. I still believe in this market over the medium- and long-term, but things could get a little bumpy over the next few days and weeks. Last month’s fear turned into this month’s hope. Unfortunately, hope leaves us vulnerable to disappointment. As always, the market can do one of three things; up, down, or sideways. Momentum is clearly higher and the longer we hold near 2,600 resistance, the more likely it is we will break through it. Trump striking a deal with Democrats and the Chinese will send prices surging higher. But if we don’t pause and consolidate recent gains, that breakout will be fragile and vulnerable to a pullback. I would be selling a sharp breakout, not buying it. This would be a buy the rumor, sell the news kind of thing. 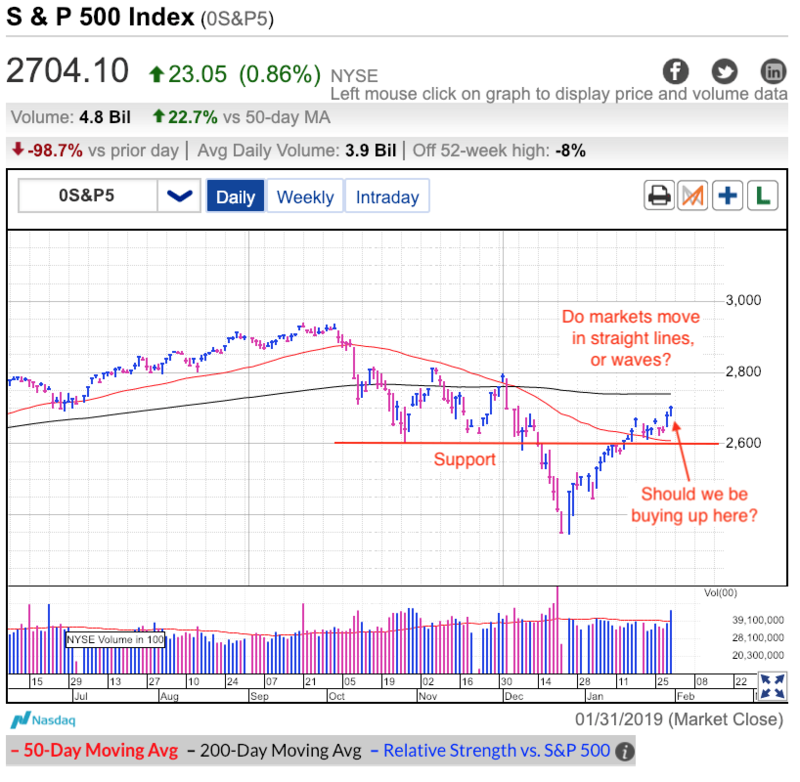 Markets consolidate one of two ways. Either they take a step back, or they trade sideways for an extended period of time. Given how volatile the market has been and how much uncertainty there is in the headlines, boring, sideways trade seems highly unlikely. Instead, this market most likely needs to take a step back before continuing its climb higher. 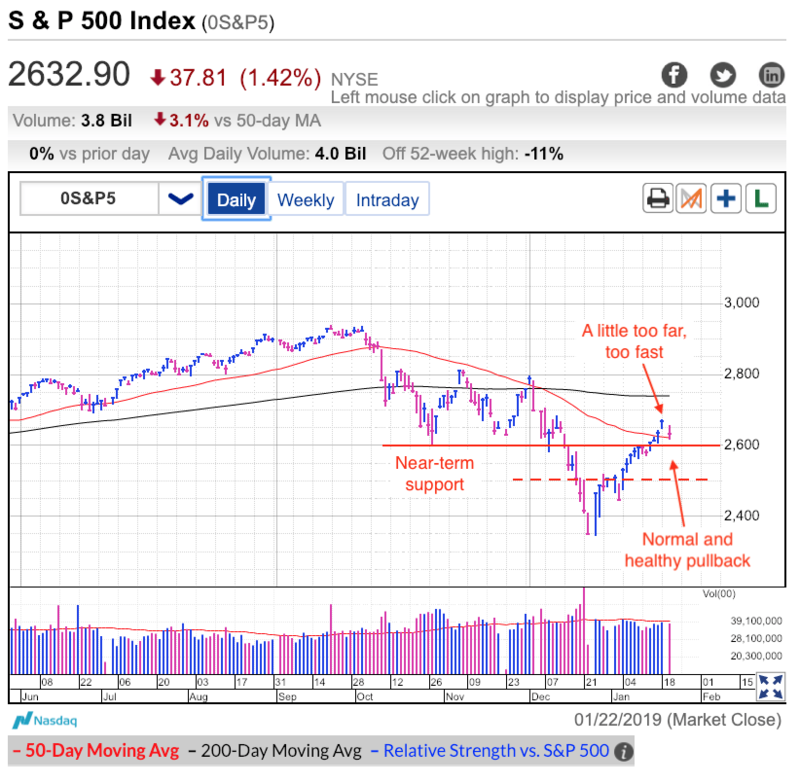 Whether that step-back starts Friday or waits until the 2,600 breakout fizzles is anyone’s guess, but at least we know what to expect and that helps us get ready to trade it. I would rather be taking profits at these levels than adding new money. A near-term dip to 2,500 that bounces would be a great buying opportunity. An unsustainable breakout above 2,600 that fizzles could be an interesting shorting opportunty. Thursday was another brutal session for the S&P 500, and we now find ourselves 16% under the October highs. The latest fears stem from Trump’s threats to shut down the government if Congress doesn’t fund his wall. These headlines pile on the already fragile sentiment brought on by Trump’s trade war and the Fed’s latest round of rate hikes. October’s stock crash was initially triggered by a spike 10-year Treasury rates. The ironic thing is interest rates have done nothing but tumble since then. But despite the reprieve in rates, the market has not been able to find its footing given the relentless barrage of bad news. In addition to the problems I already mentioned, Trump’s trade war is slowing global growth, and the US had a high profile Chinese executive arrested. Mix in fears the US economy is overheating, contracting, or somehow doing both at the same time and it becomes the perfect cocktail for impulsive herd selling. I will be the first to admit I never expected the dip to get this carried away. But this isn’t a surprise. The market has a nasty habit of pushing things so much further than what is reasonable. And clearly that is the case here. But just because I’m bullish doesn’t prevent me from profiting from this dip. While the initial selloff caught me off guard, the subsequent volatility created a rich hunting ground. I told readers in October that too much damage was done to sentiment in the first round of the selloff and we should not expect a quick return to the highs. That told us to greet every rebound with suspicion and be taking profits, not chasing prices higher. And the same applied to each dip, rather than sell the fear, I was buying it. Buy the dip. Sell the rip. Repeat. The next day the market gave up early gains and finished flat. That warned us something was wrong and we should avoid the market. A day later, prices stumbled to 2,600 support and it’s been downhill ever since. But that was then and this is now. What readers really want to know is what comes next. While I like these discounts, the looming holidays complicate the situation. What would normally be an attractive buying opportunity might struggle to get off the ground since big money already left for Aspen. Their absence puts impulsive retail investors in charge and that is rarely a good thing. Luckily, these little guys have small accounts and their emotional buying and selling cannot take us very far. We saw similar emotional selling knock 100 points off the market during the Thanksgiving week. But a few days after the holiday, the market rallied 170-points when big money returned to work and started snapping up the discounts. No doubt we could see the same thing this time around. Unfortunately, January’s reprieve is still a ways off and until then we are subject to the whims of impulsive retail traders. But as I said, the saving graces is retail traders don’t have a lot of money and it won’t take them long to run out of things to sell. Once they’re out, the selling pressure evaporates and prices stabilize. Or we could run around like chickens with our head cut off. You decide.